Each box contains 6, monthly disposable soft contacts in buffered saline solution. Have you considered trying Crystal Monthly instead of Biomedics 55 lenses? They are a great alternative, the same material, and only £30 for a YEARS supply! These lenses are excellent for the first few days but they deteriorate far too quickly and seem to become progressively less efficient, so I tend to dump them after only 2 weeks wear and start over with a fresh pair. Cheap but not cheap! They don`t provide good comfort in air conditioned environments, drying out fairly easily. Fold into the eye and disappear at the slightest touch. I`ve given up on these lenses. I have tried these lenses (not from this site I may add - i was given them free by an optcian!). And I found them to be fairly comfortable to start off with, - but are not good for extended wear. After I have had them in all day - they crinkle up in my eye. My eyes become iratated - and `get lost` easily within my eye - once they are all crinkled! Tried one box as a replacement for another brand that teared easily. No problems, one box lasted me seven months. The Biomedics55 I ordered came in a mock-looking box, somewhat unlike the original box I saved from the last supply purchased here in the US. The quality of the lens are thinner than the ones I`ve used (for several years) and easily slip around--I don`t think they will last as well as the originals. I will wear them, but I can`t believe they are from the Biomedics company. The order was late, but customer service was good nonetheless as they kept me informed. 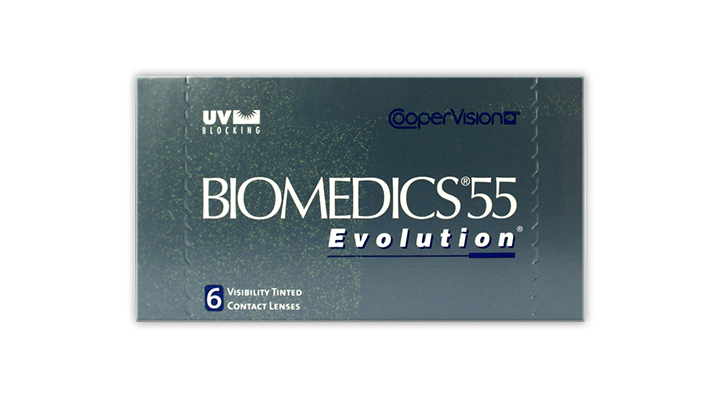 Editor: Coopervision have repackaged Biomedics 55 several times, so they can come in different boxes. The latest box is the Biomedics 55 evolution. However, the lenses remain the same. If they are slipping around, make sure that you have ordered the correct radius as your previous lenses, and that they have not been inserted inside out. All lenses that are supplied are genuine manufacturers products. I have worn focus monthly visitint and softlens 59 both without any problems but I decided to try a new brand as I sometimes do. These lenses work great day 1-7, after that they are a pain to put in as they never sit right and then at the end of the day they are so dry it is horrible. Nearer the end of the month they will be uncomfortable all day and make your eyes itch. I don't know if it is just my eyes, but I REALLY hated these lenses when comparing them to the ones I usually use.